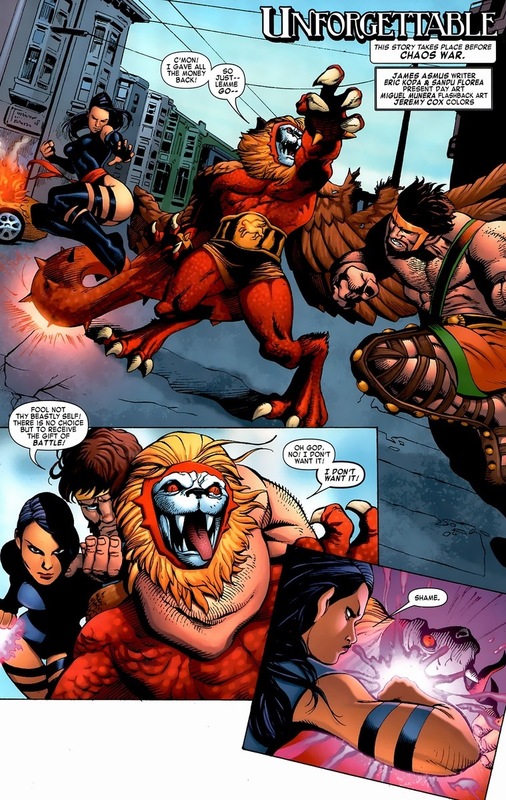 I get distracted when I find a good Hercules story, like the one I showed last time. We’ll get back to our Spider-Man articles on Monday (especially because I haven’t actually shown a story starring Spider-Man yet), but as you end your week working diligently for The Man, relax and be delighted with this little love story from X-Men: To Serve and Protect #4, written by James Asmus and drawn by Eric Koda, Sandu Florea, & Miguel Munera. This begins as most romantic tales do: halfway into the battle against a talking griffin. From what you know about Hercules, he enjoys many of the simple pleasures in life: beer, punching, and ladies. And I guess not wearing shirts. While the beer’ll come later and the punching ends satisfyingly, that really only leaves one more desire left. Like seducing a psychic ninja mutant. Hercules almost certainly smells terrible and has prolific back hair. But he is tall, strong, in fantastic shape, and speaks like he just left a performance of Macbeth. While Psylocke can totally read minds, she didn’t really need to in order to recite our dear hero’s pick up lines. By the way, those lines won’t work at your local bar. 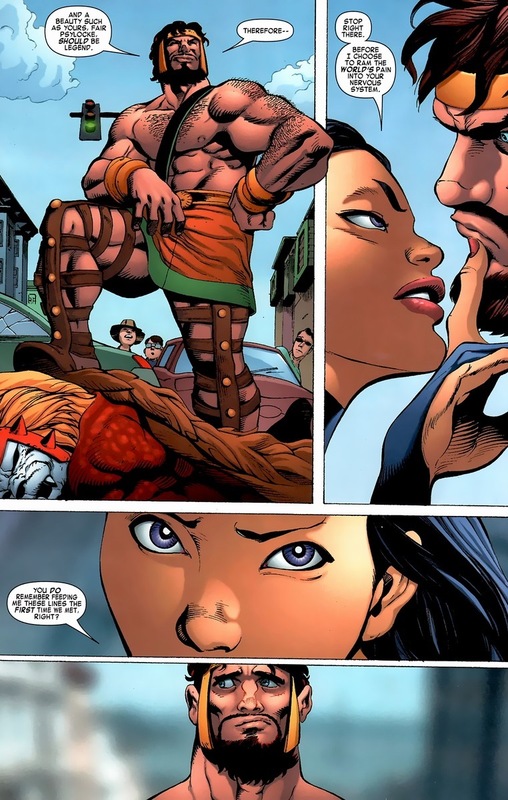 I imagine many people’ll get upset over young Psylocke’s reaction to Hercules. I totally get it. 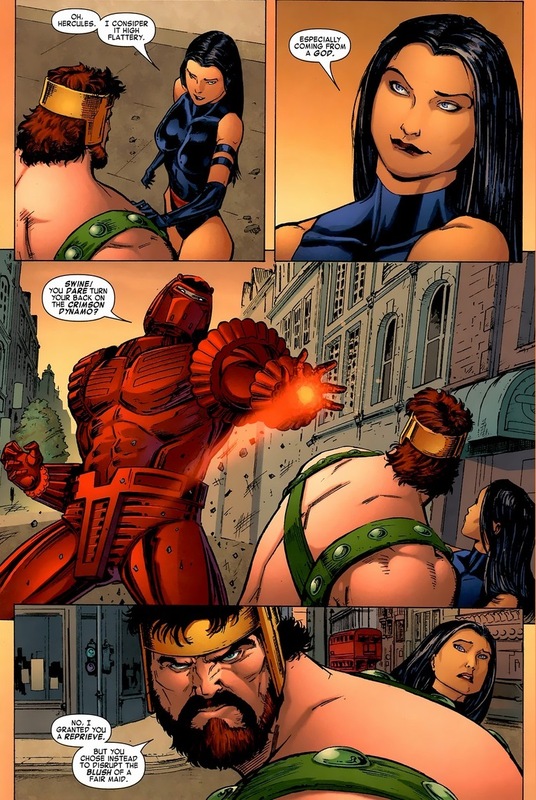 “Psylocke wouldn’t respond that way!” “Psylocke wouldn’t fall for Herc’s lines!” Maybe. But the beauty of a being a fictional character is that if this pairing upsets you, retcon it in your brain or something. And even as an adult man, if a god beat up a supervillain in front of me and offered to carry me to his bedroom, I’d need a few moments to consider. Especially gods wearing huge belt buckles with their initial on it. Yes, they totally hook up. Proof in a few pages, but I’d like to believe this story ends with Psylocke retaining her good role model for young independent women characterization. 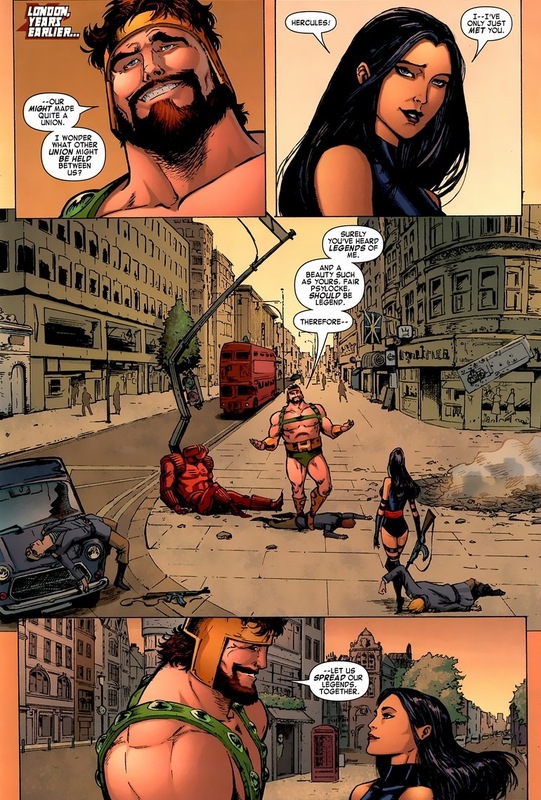 Because unlike many superheroes (say, Hercules), she learns from her mistakes. And while I wouldn’t call sleeping with the promiscuous Hercules a complete mistake (maybe if he provides a doctor’s note), she realizes in the past few years that she should devote her attention to stable relationship-orientated men instead. Like the heir of Apocalypse’s eternally damned empire. Or a schizophrenic self-absorbed French thief. Much better choices. Understand this: sure, Hercules flirts repeatedly with any girl who doesn’t wear pants to the point of both wild overconfidence and frenetic charm, but he’s always and forever a proper gentlemen. When you’ve lived several thousand years and bedded several thousand women (and a few guys *coughNorthstarcough*), you might forget a few hundred of them here and there. I would love to see Spider-Man x Psylocke in a team-up adventure as I feel that they would make an interesting team. Hey, give Herc a break! he had brain damage after nearly being beaten to death by the Masters of Evil during the siege of Avengers mansion. He was bound to forget a few things!